Using the breaking and reformation of a thousand vinyl records, artists Kevin Cooley and Phillip Andrew Lewis interpret the creation of the cosmos. The relics of this process and its final cacophonous product are on view at Pierogi gallery in Williamsburg. Taking a line from Arthur C. Clarke’s 1968 sci-fi novel 2001: A Space Odyssey, My God, It’s Full of Stars started at Nashville’s United Record Pressing. 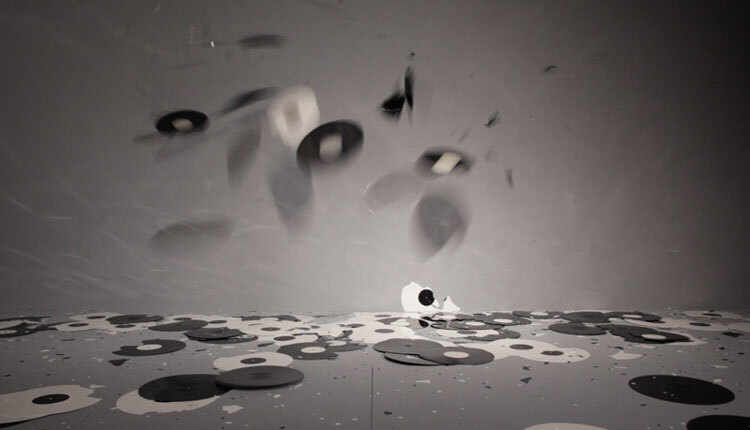 There 500 grooveless black records, and 500 grooveless white records, were made, only to be shattered by volunteers against a grey wall (a perhaps heavy-handed suggestion of black and white color mixing). A video of the destruction projects against one wall in Pierogi, in which bits of dark and light vinyl pile up against the shattering noise. This sound was recorded on one side of new records pressed from the shards, with the other side imprinted with the sounds of the records’ creation. Cosmic references aside, the project is definitely a successor to “Box with the Sound of Its Own Making” by Robert Morris from 1961 — a wooden cube which played a recording of its construction. That along with the 2001 reference and the vinyl record itself make the whole project a bit of an art and pop culture throwback. One of the Harmony of the Spheres records made from the melting of black and white vinyl bits spins silently in the gallery, the uncut edges from the pressing process left in a gnarled ring of encircling plastic. While the LP’s birth, death, and rebirth is on center stage — with limited edition box sets available — the experiments with the vinyl byproducts can be just as interesting. In “OMG, It’s Full of Stars,” raw PVC beads act as the darkness of the universe over a flat screen while suggestions of galaxies and stars beautifully emerge from the cracks; “Oddity” has a record reduced to a black blob meant to look like a meteorite. The two feel more immediately engaged in the vinyl record-cosmos crossover. My God, It’s Full of Stars, which was exhibited in another edition earlier this year at Zeitgeist Gallery near United Record Pressing in Nashville, is the first New York solo show for the duo of Kevin Cooley and Phillip Andrew Lewis. Cooley has exhibited with Pierogi before, with last year’s Skyward film installation on the ceiling of the Boiler. Together they’ve also collaborated on the video and installation “Through the Skies for You” (2013), a tribute to the missing ship of 17th century explorer Robert de La Salle, lost somewhere in Lake Michigan. Both artists have an intense interest in process and the materials, and while you might not think of the Big Bang or black holes or the formation of universes when you accidentally drop a vinyl record, there can be these grand echoes even in the simplest of destructions. Kevin Cooley and Phillip Andrew Lewis: My God, It’s Full of Stars continues at Pierogi (177 North 9th Street, Williamsburg, Brooklyn) through July 27. For the latest exhibition at Nashville’s Zeitgeist Gallery, multimedia artists Kevin Cooley and Phillip Andrew Lewis have achieved a rare feat. They’ve produced a diverse exhibition with a single material: vinyl. When I first heard about the exhibition, I assumed an all-vinyl show would be gimmicky or nostalgic. You know, the way exhibitions of art made out of old books can be. When you walk into the gallery, the space feels charged with an ominous quietude. Three undulating black vinyl sculptures, titled Dark Matter 01, 02, and 03, greet the viewer. Perched on white pedestals and each dignified with its own spotlight, the organic formations teem with potential energy, as if at any moment they could worm their way down from their towers and onto the floor. Overhead, Dark Star, a large tentacled form suspended from the ceiling, reaches out in all directions. Borrowing the title from an ancient Greek concept linking music and celestial movement, Harmony of the Spheres uses vinyl as a tool to explore themes of creation and destruction, black hole theories, points of singularity, and flat-earth philosophies. Digital scans of vinyl records hang on the main wall. Here, the vinyl records—seen broken, eclipsing one other, or fading into a black abyss—are abstracted to the point that they read more as omniscient oculi than as music devices. Standing in front of the images, which feel simultaneously cellular and planetary, the mind oscillates between perceiving the looping grooves of LPs and the celestial patterns of the cosmos. Cooley and Lewis push their material to new limits in each piece, from a starry sky made using vinyl pellets on a light box to a dense nugget of torched vinyl to a two-toned wavy tower of layered vinyl. The exhibition also includes two video works: one is the documentation of a record-breaking performance (literally) and the other, Point of Singularity, is a meditative video featuring thousands of vinyl pellets being sucked into black-hole-like central point. The vinyl for this project came directly from United Record Pressing, the largest vinyl record pressing plant in the country, which happens to be located near the gallery. The artists made many of the works inside the factory walls. “We were able to not only have records pressed, but also conduct our own long ‘shifts’ at the factory.” Inside, they built sculptures straight from vinyl remnants as they came off the presses and generated the photographs, videos, and sound for other pieces. If their first collaborative piece, which won the 3-D Award at ArtPrize 2013, is any indication of the future trajectory of their artistic partnership, then Cooley and Lewis are just getting started. “Harmony of the Spheres” is on view at Zeitgeist Gallery in Nashville through April 26. Sara Estes is the gallery coordinator at Fisk University and curator of the art space Threesquared. She lives, writes, and works in Nashville. Wedgewood/Houston is the focus of E.J. Boyer's new article in The Nashville Business Journal, "Where Art Lives: Neighborhood's Revival Fueling Nashville Arts Scene." You can read the whole article here. Describing the old Mays Hosiery Mill, Boyer says, "Inside the building, quiet hallways still bear vestiges, like an outdated time-card punch, of the building’s former life. But behind closed doors, a creative class is bringing the building — and subsequently the neighborhood — back to life." On Zeitgeist's move to the neighborhood she says, "Last summer, Zeitgeist moved to Wedgewood-Houston, bringing its followers and commercial presence to the community. York, a painter himself, has rented studio space in Wedgewood-Houston for 18 years. “First and foremost, this community is about the studio space,” he said. “Us and David Lusk are just retail points. We hope to serve as a resource and provide education when we can. … The studio community is really the lifeblood of a visual art scene.”"
Core Development has a 7 acre project planned in the area, "Vice President of Development Andrew Beaird said it’s too early to know what the final development plan will look like, but said the company wants to preserve the neighborhood’s artisan and maker history. “What we like about this neighborhood is the fact that there is a significant concentration of artisans, the music industry and a lot of people who are making and creating,” he said. “They need access to a raw space that they can customize.”"